My dog has dew claws. If yours does too, then you’re probably wondering if a dog dew claw is just an “extra” toenail or if it’s actually used in your dog’s day-to-day life. Here’s what you need to know about your dog’s dew claws — including when (or if) you should have them removed, and recommendations from veterinarians and other dog owners. A dog dew claw is similar to a thumb (complete with a toenail) — but it grows a bit higher up on the paw than the rest of the toenails on that paw. It never comes in contact with the ground. If your dog has dew claws (most dogs do), then you’ll want to pay extra attention to the dewclaws — especially during the puppy’s first 6 months of life because you need to make sure that they’re growing properly and not getting in the way during your dog’s regular activities. Does Your Dog Have Dew Claws In Front? In Back? Or Both? Dew claws on the back paws is fairly rare for dogs in general. But it’s somewhat common in certain breeds — including Great Pyrenees dogs. Our Great Pyrenees/Black Lab mix has dew claws on both his front and back paws — though he doesn’t have the “double dew claws” (2 claws stemming from one single area) on his hind paws as is typically standard for the Pyrenees breed. Rest assured that most dogs with dew claws do just fine without having to remove the dewclaws. But sometimes the dew claws are not “properly attached”. They may also “dangle” or “hang”, or just get in the way during the normal course of playing and walking. Not to mention the fact that dogs with dew claws who also like to dig a lot will sometimes irritate the dew claw, or even break the dew claw bone (not all dew claws have bones). This usually happens when reaching through a chain link fence — or something similar — where the dew claw gets caught. If the dew claws on your dog’s front or rear paws seem to easily get caught on things, then they could easily rip off — which would be very painful for your dog. In this case, you should talk with your vet about whether or not to have the dewclaw(s) removed. Most dog owners who opt to have their dog’s dew claws removed have it done at the same time as the dog’s spay or neuter surgery. That way, there is only one time going under the anesthesia, only one period of time for recovery, only one visit to the vet, and only one office charge. NOTE: Dew claw removal involves removing the entire toe, not just the claw, and the cost may increase if the toe is firmly attached. When done at the same time as the spay/neuter, some dog owners have indicated that the recuperation period for the dew claw removal seems to take longer and be more stressful for the dog than the spay/neuter surgery part of the surgery. For the most part, dogs seem oblivious to the stitches that result from the spay/neuter, but they can’t seem to stop licking at the bandages which must remain on their paws for weeks from the dew claw removal. Many breeders choose to remove dew claws on puppies in the first week of life — because soon after birth the dew claws are more like fingernails than appendages. At that young age, dog dew claws can be removed relatively easily and no stitches are required. With our Great Pyrenees dog, it appeared early when he was a puppy that his rear dew claws were sticking out too far and could get caught on things. We were encouraged to keep an eye on his rear dew claws for a few months — before making a decision regarding the future of Tenor’s dew claws when it came time for his neutering. At 6 months of age, when when we made the appointment for Tenor’s neuter surgery, we realized that he hadn’t had any problems with the dew claws catching on anything — so we decided to leave them intact. The vet assured us that he’d be just fine. Since we chose to leave Tenor’s dew claws intact, the vet said that we’d have to pay extra attention to keeping the toenails on the dewclaws trimmed. 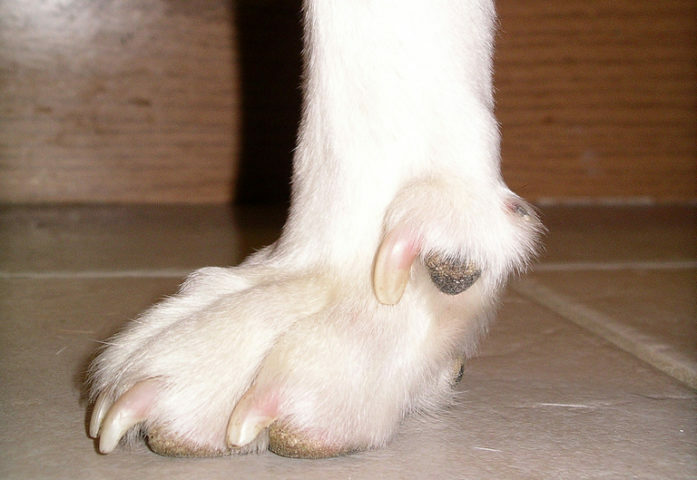 A dog dew claw is higher up on the paw — so it won’t get any wear in the normal course of walking. If a dew claw is ever allowed to grow long, the quick will grow proportionately — making it more and more difficult to keep that toenail short. Here’s an excellent photo tutorial showing how to trim your dog’s toenails (especially when they’re black, and it’s hard to see the “quick”), which type of nail trimmer is best for dogs, and some expert advice about dog dew claws. This video shows one important way that dogs use their dew claws. Here’s the perspective of the show dog community regarding dog dew claw removal. Check out these tips for taking care of and treating a dog’s torn toenail. Dog breeds that commonly have dew claws, or even double dew claws.